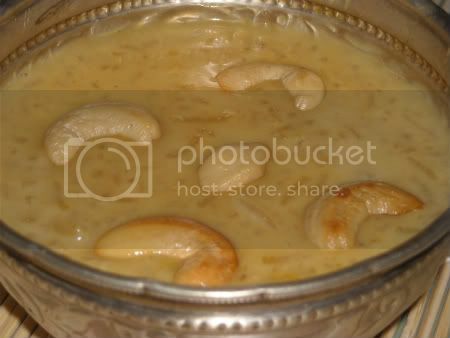 Paramannam or rice payasam is the most common prasadam in andhra.In my house mom used to make this for every festival as this is the most favourite dessert.Paramannam can be done with both sugar and jaggery but i prefer jaggery.This sweet can be eaten both warm or cold. Drain water from the rice after one hour and add milk. Cook till the rice is soft and if needed add little water or milk. Mean while fry cashewnuts and raisins in the ghee. Once the rice is cooked and is soft switch off the stove and add grated jaggery,cashewnuts and raisins. Mix throughly and cover it until served. PS:-After adding jaggery don't cook payasam,if cooked it will split. The prasadams i made today. 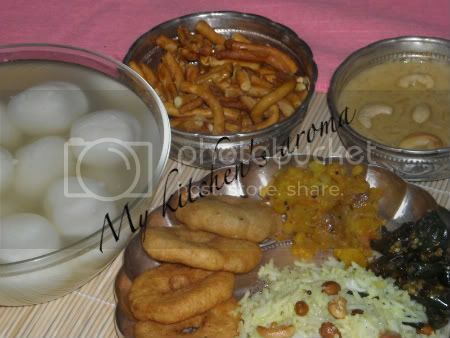 wow what a spread Saritha mmm nice pujapic. DO sneak a peek in my blog when time permits .. n leave your valuable comments!! Lovely dishes and a very Happy Diwali to you and your family. Lipsmacking paramannam, hope u had a blast..Happy diwali wishes! Pudding is one of my favourites during the festivities! I love it! It looks nice and superb! Looks amazing all recipes sounds yummy!!! Tnx for stopping by kothiyavunu & for the nice comments.u have a fabulous space here! Really amazing presentation!! !following u dear! 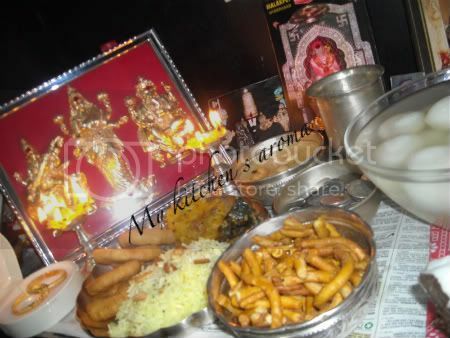 lovely pictures and nice prasadams.you have a nice blog.you can also visit my blog and give ur comments. Looks delicious.. Beautiful spread! Hope you had a colourful celebration!